The RAPT formatted data is like a cut down version of AVETMISS, and includes student enrolment information like their USI. Where your training data includes both outcomes created via students enrolling in onCourse classes and outcomes created by importing data into onCourse (prior learning), this option will collect all outcomes for all students that fall within the specified date range. If you only want to select student enrolment data for a specific class group, or for selected enrolments, you can begin the RAPT export process from either the class or enrolment window. As per the instructions for exporting all training activity above, a sheet will open. When you are exporting from the classes or enrolment cogwheel option, however, you do not have to enter a date range. It is still important that you select the AVETMISS flavour 'WA RAPT' in this window. All other data is reported directly to NCVER via the AVETMISS validation software. 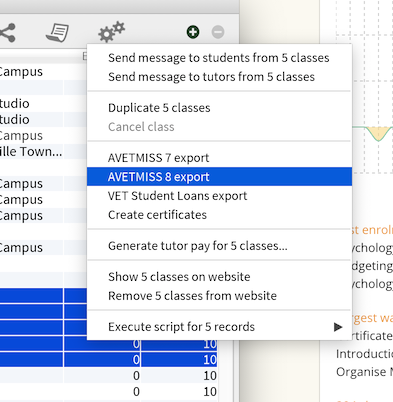 You can extract your AVETMISS data from onCourse via the AVETMISS standard to meet the total VET activity reporting (TVA) requirement in WA. 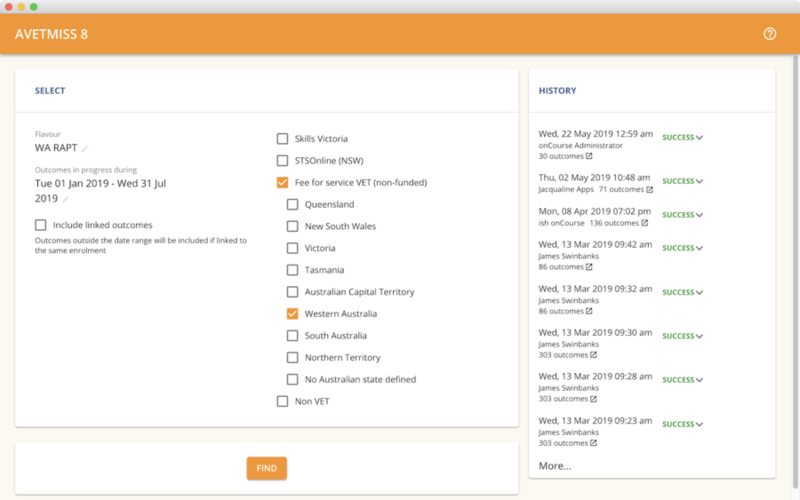 Following the same instructions as 'Exporting all training activity to RAPT' above, but this time selecting the flavour 'AVETMISS standard' will export the standard AVETMISS files you then need to upload to AVS for validation and lodgement. The Client Qualifications Register (CQR) is a system for the permanent recording of ​Australian Qualifications Framework (AQF) student records from RTOs. Therefore in the event that an RTO ceases to trade, students will still have access to their records and employers will be able to verify qualifications. To export this data from onCourse, begin by opening the certificate window from Activity > Certificates.